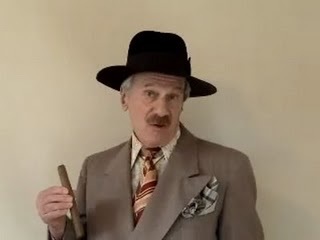 Some of you might remember a late 1970s comic routine called "Raymond J. Johnson Jr" The character (shown at left) becomes annoyed when addressed as "Mr. Johnson" and exclaims "My name is Raymond J. Johnson, Jr…now you can call me Ray, or you can call me J, or you can call me Johnny, or you can call me Sonny, or you can call me Junior; or you can call me Ray J, or you can call me RJ, or you can call me RJJ, or you can call me RJJ Jr but you don’t hasta call me Mr. Johnson!" Lots of equivalent names for the same person. Sometimes that happens in science and sometimes the exact opposite happens where lots of different things are all known by the same name - for instance 3D. When it comes to 3D be careful that you understand what you’re reading about and don’t always trust that the author has the knowledge or took the time to do the same. 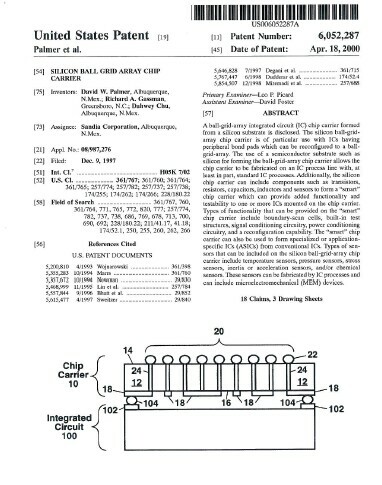 The other day I decided to google "silicon ball grid array" and come up with a patent issued to old friend Dave Palmer, recently of Sandia. To be exact we are talking USP 6,052,287 filed in Dec of 1997 and issued in April of 2000 which gives it another 6 years of life. If you’re in the business of making or using such interposers, you might want to give this patent a look ! Others point to the IBM patent 3,343,256 (1964) "Methods of Making Through connections in Semiconductor Wafers" and contest the validity of the Sandia patent. Only a legal battle will truly tell ! Cannon latest to enter packaging market. 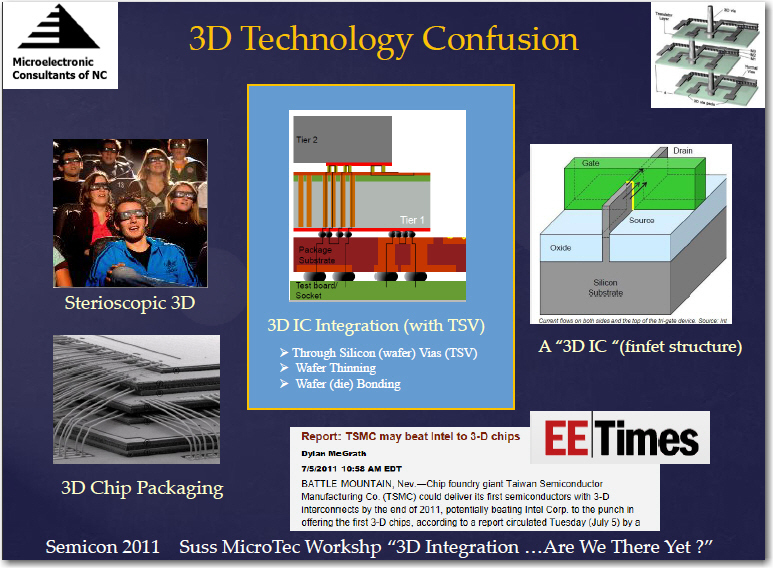 With the number of players decreasing with each succeeding generation of scaling [ see PFTLE 121 "IC Consolidation, Node Scaling and 3D IC"] it is only logical that front end IC equipment vendors would be looking at the IC packaging market as an area into which they can expand. The latest equipment supplier joining the group is Cannon who made its first foray into the semiconductor back-end packaging equipment market with a lithography tool for through silicon via (TSV) and bumping. Canon modified their front-end tool series to accommodate the thicker resist films used by TSV and bump structures. The system’s projection lens optics expose 52 x 34 mm, compared with the 26 x 33 mm area exposed by front-end tools.